The angels didn't speak much but they had a minder who was chatting with some cross-waving Irish ladies, patiently waiting to see their spiritual leader. "No, we aren't here to perform", he explained, smiling, "Actually we're from Gaydar, - we're here to protest"
"Gaydar? ", they hadn't heard of it, "so you mean.... you are all gay?" "Well, now I don't have anything against gay people, but really I don't think they should flaunt it"
Meanwhile the policeman was having a better time with the whole rapport and communication thing. Establishing that the angels were local he imagined that maybe they were part of the Richmond LBGT network? They were. "Oh, well you'll know one of the PCSOs at our nick then, he's quite involved there", and gave a name. They knew him. Considering it is a State visit that cost £20m to police it was a pretty small affair. Around 100 policemen watched 75 demonstrators and perhaps 300 supporters who lined the narrow pavements together and mixed good naturedly. Journalists patrolled up and down talking to protesters. Most of them chose to interview Nina, a photogenic and articulate young woman carrying an umbrella decorated with colourful condoms. She spoke eloquently about a woman's right to control her own fertility, and protect her own health. The mingling policeman asked her for her surname, which she declined to give. No one interviewed the catholics. The sun shone and we waited; after a while a postman cycled up the road to wild cheers from the school children lining the side. Behind the protesters stood Peter Tatchell, thin and old looking now, in a sober suit "Look, it's that bloke from Channel 4", said a young protester. The policemen shifted their weight, walked up and down, and explained that no, they didn't know when the Pope was due to arrive. The crowd basked in the sunshine. One top of St Mary's University, some armed police were visible with binoculars. A helicopter hovered. And then the Pope arrived: invisible in a Jaguar behind dark glass windows, preceded by outriders and security his car came from the opposite direction from expected and dived directly behind the gates, not even passing the bulk of his school-age supporters, who were expecting him from the other direction. Blink and you'd have missed him. The demonstrators built up a half-hearted chant of 'resign, resign' the catholics waved flags and whooped, and then it was all over; the crowd dispersed, I went for a bacon sandwich at the cafe and chatted with an earnest priest. In the wake of the G20 all the police officers present were clearly identifiable: with their warrant numbers on their shoulders and and in many casesalso their names on their chests. Except this one. The red shoulder tags signify an Inspector. Standing outside Farringdon Station waiting for middle-daughter I took a moment to OCD our tickets a tenth time and now, of course, I notice what I hadn't noticed the previous nine times: Strictly Over 18. Hmm, middle daughter is just sixteen - Panic! "Hi Dad, so, where is this place we're going to?" "It's called the Slaughtered Lamb"
"so, is it a pub?" "Well, it's sort of, kind of a pub thing, yes, I suppose it is"
"Well, I hope it's not over 18 only!" "hmm, no - look grown up and, um, inconspicuous"
Sigh, I am not cool, we arrived at exactly the wrong time for a gig: too early for the main act (an hour and a half to wait!) but too late to secure one of the leather sofas directly in front of the stage (curses) . Unwilling to stand up we lounged on an uncomfortable bench behind a pillar and waited until the friends and family of the (quite dreadful) first support act got up and left; and then craftily nabbed the empty seats. When the support2 was finished, a group of fresh faced kids invaded the stage to get it ready for Caitlin and her band. Then, to our astonishment, they picked up their guitars and stood ready at the mics. It was Caitlin's band: lead guitar Jeremy Fetzer, in particular looking like he had just obtained 11 A* at GCSE, and feeling excited about wearing his own clothes in the sixth form. He turned out to be a smooth guitarist, but he didn't like to sing, and shifted uneasily if a mic came too close. 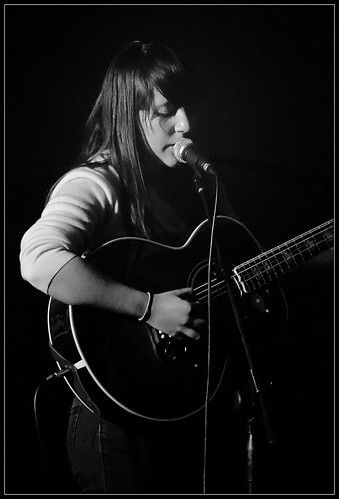 Caitlin Rose, on the other hand was assured and effortless. Her voice and delivery reminded me of Iris Dement, she handled the crowd with aplomb, only momentarily disconcerted by losing her special pick. Caitlin is heralded as alt. Country, but to me her songs are slap-bang in the country tradition: funny, heartfelt, simple in lyric and telling story. Now, I wouldn't say Caitlin Rose was obscure exactly, its just that precious few in the Uk have heard of her, and to tell the truth I had heard her only once on Bob Harris country, and just before she came on MD shamed me by asking for my favourite Caitlin Rose track and - when I was forced to prevaricate, astonished me by naming three of hers. She had done her research. (And a week later is still listening: a teenage country music fan in London. Thus do parents influence the lives of their daughters. At the gig, MD and everyone else in the audience were able to recognise and welcome the highlight songs Learnin to Ride, Own Side, Things Change and a sing-a-long Answer in one of these Bottles. Only I was mouthing the words. On her recordings Caitlin's voice is mellowed and softened, and the arrangements sometimes slightly lush. At the Slaughtered Lamb her songs benefited from the stripped down band (lead, bass, pedal steel) and unrestrained vocals, emotion allowed to bleed in to the melody. "Are you having a good time?" she asked, at one point, "because you're all very quiet" "We're English" came the apologetic response, and to make up for our poise of apparent indifference we clapped, dutifully, all the way through to the Gorilla Man. There were about 150 or so people there I suppose, a small gig, but her support is is growing. Her UK tour includes a dozen dates, and where she is top of the bill she is selling them out. She comes from Nashville (of course she does) and I wondered what it takes to get the breaks in that competitive town, to get listened to in the first place. How do aspiring young singer-songwriters get noticed? Is it luck, or is talent so plain that even the dimmest A&R can recognise it when he browses myspace? Or is it something else? Cynically I googled, and whaddyknow? her father is mainstream country singer, and her mother an award winning co-writer for Taylor Swift. Contacts, then. Thus do people achieve lift off in a competitive world, and thus do parents influence the lives of their daughters. 1I have a plan, myself and two mates. Well perhaps more of a whim: a six week journey through the southern states every night listening to country music bands playing live. Moving from town to town, from bar to bar we'd hear the old and broken, the new and hopeful, the tired and the bittersweet artists that I imagine are the country music scene, travellin' light, hittin' the road, staying in motels with screen-doors slammin', always going where luck and the music took us, a journey partly spontaneous, partly planned. Oh yes, and one of the friends used to work for the BBC, so surely we could meet famous bands and interview them in the comfortof five-star hotel rooms, recording sycophantic interviews and, each morning, making a video diary in which we mocked, in a very British way, the unsophisticated acts we'd seen the night before. I'll write blog and book, my exBBC mucker a podcast and hour-long reflective programme for channel four and my other friend, a sober lawyer, would drive the RV and keep us out of trouble. And write poems. (Yes, I am practicing my pitch). It will be called The Judge the Journalist and Jerk, in search of real Country, it would start in the Smokey mountains and end at the Grand Ole Opry for CMA Awards. Would you like to sponsor us? Just £100 will buy a Budweiser a day for one person for the whole trip. Our just giving page will open soon.